Welcome to Day 12, The Final Day of Gameplan Bootcamp! Oils of the training: Sarah’s favorite business oil: Highest Potential. Also: Build Your Dream, Sacred Frankincense, Sacred Sandalwood. Oola Grow, Believe, and Present Time. You have made it to the final day! 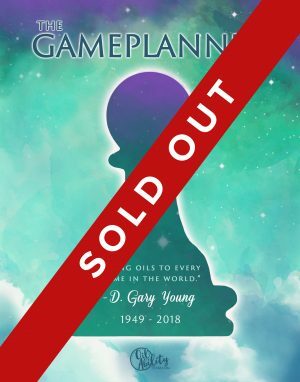 When you have completed this video and read the book and finished the workbook, you have finished the hardest training in all of Young Living. You have the equivalent of a unofficial college degree in network marketing, without the student loans. These twelve videos truly sum up every single thing that Sarah did to make Diamond in 2.5 years from her starter kit. 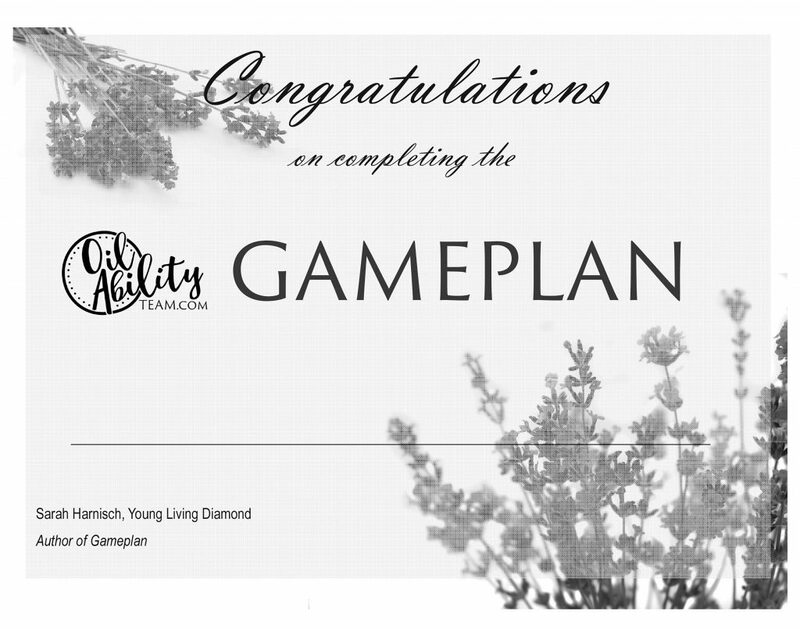 If you can implement the tools you have learned, master the art of the relationship and listening to people and meeting their needs—training the lifestyle over the starter kit and building duplication into your leaders using Gameplan training, you have every ounce of what you need to go Diamond. Now, it’s time to move!! The Oil Ability Team is so very proud of you for making it this far! At the bottom of the page, you’ll see a Gameplan certificate. Print it out and sign it for your leaders that have completed the training. If you are coming to a Gameplan event, bring your book (the certificate is in the back) and ask Sarah to sign it for you after the event. She always does. What do we cover today? Avoid the pitfalls that will sabotage your business (or slow you down as you try to rank.) Sarah knows each one well– and how to avoid them– because she made every mistake! It’s how Gameplan was birthed, by hundreds of mistakes. Today’s video will clarify your vision and bring all that you’ve learned in the last 11 days into focus, helping you see where you are at and what is YOUR next step. 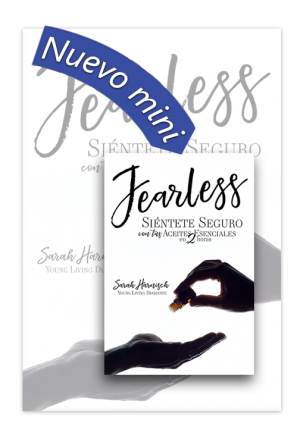 Sarah addresses the mindset you will need to maintain to move forward, and shares stories of success from the Oil Ability Team to inspire your Young Living journey! Make a list of actions that will produce growth. What are the three income producing activities? Find your color personality and resources for understanding and motivating your leaders here. Get the color personality book “Full Spectrum Success” by Platinum leaders Jacob and Sarah Adamo HERE. Write out what success looks like for you. What would you do with a Royal Crown Diamond income? Can you see it for your family? What does freedom look like for you? Gameplan Audible Version: Do you know there’s a totally different way to allow Gameplan to train your brain? One of the things Sarah does to reward her leaders that work through Gameplan is to gift the audible Gameplan book upon completion, or when they Train 2 to Train 2. When you listen to the book in audio format, you’re training a completely different part of your brain. You will learn things you never caught the first time around doing it visually. Plus, Sarah has been a radio network news anchor for 22 years in Chicago and New York—and it’s her soothing voice on the recording. Allow her to whisper in your ear and train you herself. You can listen on your cell phone! Now it’s time to take a step from the learner to the leader. You do that by training 2 to train 2. It’s not as tough as it seems—because Gameplan does all the work for you. 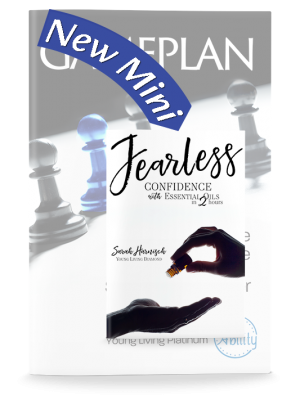 Give your budding leader the book and workbook, lead them to the 12 free bootcamp videos, and be an accountability partner as they work through. Ask leading questions each day like ‘what are your excuses?’ ‘What is your biggest distraction’, etc… and be there to check in that the reading and workbook are done. When they are done, incentivize them to train 2 to train 2. If you can train 2 to train 2 just 12 times… if you lead just 12 bootcamps with new people each month, and they duplicate what they have seen, you’ll have an organization of 531,000 people and be a Royal Crown Diamond in 1 year. It’s all in the duplication. What would happen to your business if you truly committed 1 year of your life to it? What if you taught 4-6 classes a month for a year, talked to the people that came to class at the end of every month and built relationships and trained a lifestyle for essential rewards, and trained 2 to train 2 every month for a year to build leaders? You would blow up your OGV. Commit to the Gameplan challenge for a year and see where it takes you. Give it twelve months. You’ll have a completely different definition of freedom one year from now. Do you have it in you? Do you have what it takes? It’s Gameplan time! Don’t miss the last video! 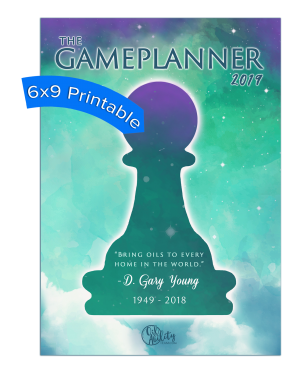 Check out the liquid gold of Gameplan by watching the bonus Appendixes video HERE.